20 million people hang in the balance. The end of the Affordable Care Act is now in sight. 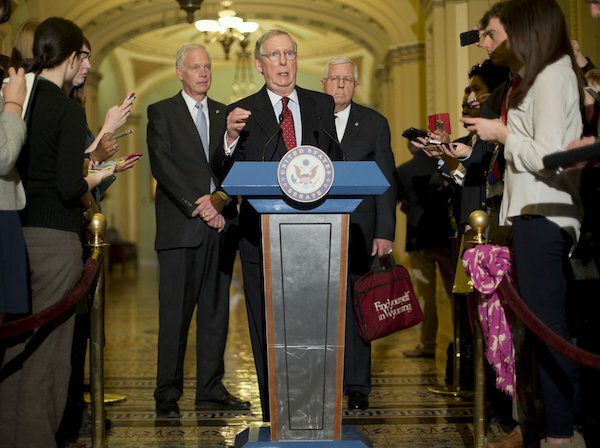 Senate Republicans voted in the middle of the night to approve a bill that will allow the repeal of President Obama’s signature healthcare law without a filibuster by Democrats, though members of the GOP expressed widely differing views on what to do after a repeal. The vote, taken at 1:30 a.m. ET Thursday, was 51 to 48. It came hours after President-Elect Donald Trump endorsed repealing the ACA before a replacement was in place. Democratic senators staged an unusual protest tactic, taking the floor one by one during the roll call vote to voice their disapproval of the Republican party’s attempt to repeal the ACA without a replacement ready to cover the 30 million of Americans who could lose coverage. Sen. Maria Cantwell (D-Washington) said that Republicans were “stealing health care from Americans,” while Sen. Ron Wyden (D-Oregon) said he was voting no “because health care should not just be for the healthy and wealthy,” according to the New York Times. But the protests were unable to stop the Republican momentum to repeal the bill as quickly as possible. The pace of the repeal seems to be sowing discord among Republicans, however. No official replacement plan has been submitted yet, and Republican senators expressed differing views to the Times on Thursday about how and when the repeal should happen. Sen. Bob Corker (R.-Tenn)wanted a deadline of March 3, while Sen. Rob Portman (R-Ohio) said that the Jan. 27 deadline was “the earliest we might do it” but said Republicans believe it could take much longer. Sen. Susan Collins (R-Maine) said she hoped the repeal and replacement would happen at the same time, and doubted that would be in the next few weeks. As for why Republicans continue to pursue a repeal of the ACA, Sen. Rob Wicker (R-Miss. )explained the Republican’s motivation to dismantle the health law as “an opportunity to keep our campaign promise” and to help President-Elect Trump and Vice President-Elect Mike Pence keep their campaign promises. The next step in the process could come as early as Friday, when the House of Representatives is expected to vote and trigger the process to begin crafting an actual repeal bill, according to CNN. In the meantime, millions of newly insured Americans will wait to see whether they will continue to have access to affordable healthcare.